Twenty five years ago, pediatric oncology camping became possible because medical advances in the treatment of childhood cancer led to stable remission patterns and, in some cases, permanent cure. An increase in survival rates and additional attention to the psycho-social and developmental needs of childhood cancer patients opened the door for the Children’s Oncology Camping Association International (COCA-I) to bring children living with cancer together. “The camp experience has been responsible for setting a strong foundation for my children. They realize that they are not alone in this journey. Because of this support and unconditional love, they are growing up into young adults and giving back to others by volunteering at camp,” one parent noted. The pioneering members of COCA-I found the lives of children with cancer were immeasurably enhanced by camp. Noting their similar experiences, these visionary souls believed a forum should be created to share their ideas and experiences. Today, that forum is COCA-I, and it has grown to include over 65 member camps from within the United States, Canada and Europe. By strengthening the international community of pediatric oncology through networking, advocacy and education, the camps are able to create magic for these children and families. What Is A Cancer Camp? 2. Their physical inability to participate in activities. With 10 to 15 percent of the population under the age of 16 being afflicted with cancer, it is important to have camps and special places to meet their needs. In the world of oncology, camp is not a place for dying children, but a place for those affected by cancer to be kids again. Since compassion and understanding are the basis of the camp programs, it would be neglectful to ignore the fact that some will not be coming back. This glaring truth of cancer provides the motivation for those involved in oncology camps to give their time, energy and passion to make these special programs a success. A child newly diagnosed is suddenly thrown into a strange adult world where the cure often seems worse than the disease. The demands of living with cancer are traumatic for patients, their siblings and parents. Most kids with cancer don’t want to be treated differently, yet some wish to reveal the difficult times they are having, without others feeling sorry for them. The ultimate goal is to make all campers feel like the children they were before the disease. Oncology camp offers a variety of programs--from traditional, overnight camping and day camps to weekend retreats and hospital-related activities. COCA-I campers include patients, siblings, bereaved siblings and parents, who often go through the entire course of the disease--from the newly diagnosed to those on treatment or in remission to survivors. Camp Trillium--an oncology camping program serving the province of Ontario--runs numerous programs for the entire family as a way of recognizing the impact of childhood cancer on each family member. Family camp provides an opportunity for families to share their experiences outside of the hospital. Parents can reassess their relationship with each other and their children. It provides a chance to enjoy a recreational experience filled with happiness and laughter, knowing that the child’s medical needs are looked after, and that health and safety are a number-one priority for staff. How Does Family Camp Work? 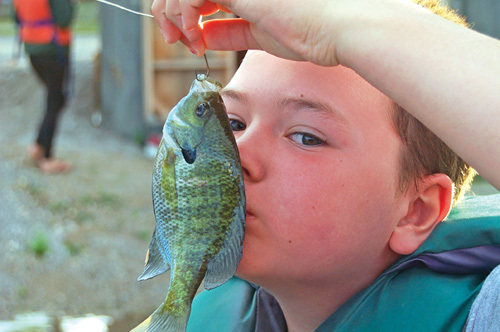 At Camp Trillium, families live in shared accommodations with up to two other families. They are assigned counselors whose roles are to develop positive relationships with the children, and to be a resource for parents. These counselors are available as much or as little as needed, and provide opportunities for family time as well as for families to gain independence, develop new friendships, and try new activities based on interests and abilities. In a typical day there are a number of activities where children are divided into age-specific groups, and parents get to meet other parents and try out camp activities. Other times, there are evening programs where families work together as a team, and campfire where families may wind down together at the end of an exciting day. “Camp represents normalcy for us. Waking up early for polar bear dips, quietly making beaded bracelets on a hazy afternoon, casting a fishing line and anticipating catching the big one, watching kayaks filled with kids gliding across the lake, assembling hungry campers and their friends at long wooden tables eagerly awaiting their table’s turn to sing meal-time songs, enjoying a campfire with young children wearing warm flannel pj’s and sidling up to their counselors--camp is where we reconnect as a family with other families, and enables us to return home and wage war against this disease that threatens the very essence of our lives--our children,” according to the observations of a parent. While these family-camp programs offer a similar experience to many traditional camps, there are special considerations taken to make these programs a success. Camp counselors must have a certain level of maturity to navigate both the physical and emotional impact of working with children with cancer and their families. Staff training must include some insight into the experiences these families are bringing with them, as well as a clear understanding of the health risks some of these children are facing. Creativity is required to keep these health risks in mind while creating programs and activities that let the family engage in ”typical” camp activities. Working with adult “campers” also requires a unique skill set, including training in facilitation and listening. These skills are essential in helping parents understand the structure and rules necessary when running a safe and accredited camp program. For more information, visit www.coca-intl.org. Sawin, K., S. Lannon, and J. Austin. “Camp experience and attitude towards epilepsy.” J Neurosci Nurs 2001; 33: 57-64. Cadman, D., et al. “Chronic illness, disability and mental and social well-being.” Findings of the Ontario Child Health Study Pediatrics 1987; 87: 884-889. Marci Shea-Perry is currently president COCA-I and serves as executive director of the Trillium Childhood Cancer Support Centre at Camp Trillium. She can be reached via e-mail at marcisp@camptrillium.com.